The need to develop superior products will promote growth of CFD. Open source CFD could pose a challenge to this growth. The latest release of the Parasolid 3D modeling kernel includes new features that facilitate the direct editing of models by adding capability to existing tools designed for editing individual faces. Several new modeling features have been added pertaining to trimming and Boolean operations. And face simplification and other tools have been added to the geometry modeling suite. 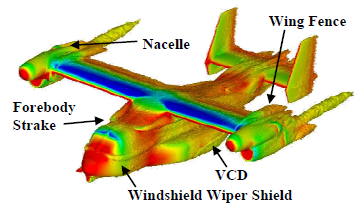 FUN3D solution for the MV-22 Tiltrotor at 6 deg. AoA. Vorticity isosurfaces colored by pressure. Image from paper referenced below. The call for presentations is now open for the NAFEMS North America Conference to be held 11-12 September 2012 in Washington, D.C.
Read more about ANSYS’ 50:50:50 approach to automotive aerodynamics simulation (registration required). Biofuel production benefits from CFD simulation. Symscape shares with us how fishing nets have been used for centuries to deduce current bringing new historical significance to the field of mesh generation. GE Energy in the UK is looking to hire an engineer to perform CFD analyses. The most significant contribution to LEED certification of new student housing at UC San Diego comes from natural cooling via ocean breezes which called for the building’s design and arrangement to be simulated using CFD. According to Desktop Engineering editor Kenneth Wong, cloud computing was the buzz of this year’s Conference on the Future of Engineering Software. The cloud today was compared to the internet of 1996 – times are changing and we just don’t know it. However, another COFES attendee pointed out the irony of talking about the cloud in a hotel where internet connectivity was virtually useless. Infrastructure issues aside, do you see the cloud impacting your use of CFD in the future? Simulation Lifecycle Management – Is it for CFD? The Engineering Matters blog has recently posted several articles on the topic of simulation lifecycle management (i.e. tools and techniques for analysts that mirror what designers get from PLM). The most recent post is about Simulia SLM in particular but it raises interesting questions about the utility of such tools. Do you use SLM tools now? If not, are you considering future use? Remember When Google and Adobe Were the Biggest CAD Companies? It wasn’t too long ago when you could have argued that Google and Adobe were the two biggest CAD companies in terms of market capitalization or potential user base. Google had SketchUp and Adobe had TTF which provided the basis for 3D PDF. Adobe’s foray into 3D lasted about a year before they jettisoned TTF (but of course kept 3D PDF) and just this week Google sold SketchUp to Trimble, a company best known for its GPS and related positioning technologies. This entry was posted in Applications, News and tagged ANSYS, FUN3D, NAFEMS, OVERFLOW, Parasolid, Siemens PLM, Symscape. Bookmark the permalink. @cloud computing – Back in the late 1980s/early 1990, cloud computing meant getting a research grant to run your code on one of NASA’s (then called) supercomputers. You wrote a cfd code, logged on to one of NASA’s computers (somewhere out there) and waited for the results. I then thought that one day (in the near future), I would be able to run such a code on my PC given improved memory capacity and processor technology. It seems that after the first one or two iterations, computing keeps jumping from mainframe -to- dedicated workstation – to- “cloud” – to – …(dedicated quantum simulator???). You could very easily make a case that what’s old is new again – cloud computing is just a “Web 2.0” name for remote mainframe. The CAD companies are dealing a lot with cloud-based issues and often find the cloud to be lacking in several regards. Certainly, using the cloud today is a lot easier than logging in to a NASA computer back in the day. Maybe we should believe these estimates given that we – i.e., LinkedIn CFD group members – helped with the analysis! In some sense it’s like “top 10” lists – they usually get us talking about what’s been left out. I’d like to think that “Open source CFD could pose a challenge to this growth” is wrong and instead OS CFD contributes to the growth in support software and consultancy – though I have no data to back it up. I would imagine more CFD solvers (open or closed source) is good for Pointwise – more mouths to feed mesh. We discussed the “open source challenge” in the office also. The study’s authors seem to think CFD is a zero-sum game. I tend to agree with you – availability of open source codes brings new people into the CFD market. Those new entrants can generate all sorts of market activity from consulting all the way up through eventual use of commercial tools. The same would be true if we all of a sudden got a new big player in commercial solvers.